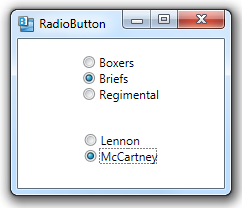 RadioButton controls allow a user to select one item from a number of different choices. When the user clicks on one of the choices, it’s marked with a blue circle and the other choices are cleared. The behavior is that only one of the RadioButton controls can be active at any given time. The XAML for this behavior is straightforward. WPF will automatically generate the behavior that enforces only one of the RadioButton controls being selected at any given time–when they are all children of a common parent control. If we add a second StackPanel control with two more RadioButtons, we then get two separate groups of choices.